Ronnie O’Sullivan beat Mark Selby 10-4 in the final of the Dafabet Masters to win the title for the fifth time. O’Sullivan did most of the damage in the first session by taking a 7-1 lead, and despite a few late wobbles, he clinched victory with plenty to spare to win the £200,000 top prize. The 38-year-old from nearby Chigwell received vibrant supported from a packed house at Alexandra Palace during his record tenth final appearance. His fifth victory in snooker’s most prestigious invitation event brought him within one of Stephen Hendry’s record of six. Matching the imperious form which gave him the World Championship crown in 2012 and 2013, O’Sullivan conceded just seven frames during the tournament, beating Robert Milkins 6-1, Ricky Walden 6-0 and Stephen Maguire 6-2. His performance against Walden was one of the most devastating displays ever seen in a televised event. Over his four matches he made two centuries and 19 more breaks over 50. It was his third final against Selby; in 2009 O’Sullivan won 10-8 and a year later fierce competitor Selby gained revenge with a 10-9 success. O’Sullivan’s work with psychiatrist Dr Steve Peters in recent years has helped him cope with the frustrations of not having everything his own way during matches, and the challenge of tussling with never-say-die opponents like Selby. This time last year, O’Sullivan was doing voluntary work on a farm in Essex, during a long sabbatical from snooker. He now seems to have found a balance in his life on and off the table which has enabled him to play the best snooker of his career over the past two years. With five World titles and four in the UK Championship, O’Sullivan now has 14 ‘triple crown’ victories and it is conceivable that he could beat Hendry’s record of 18. Leicester’s Selby was playing in his fifth Masters final in seven years and chasing his fourth title, but had to settle for the £90,000 runner-up prize. 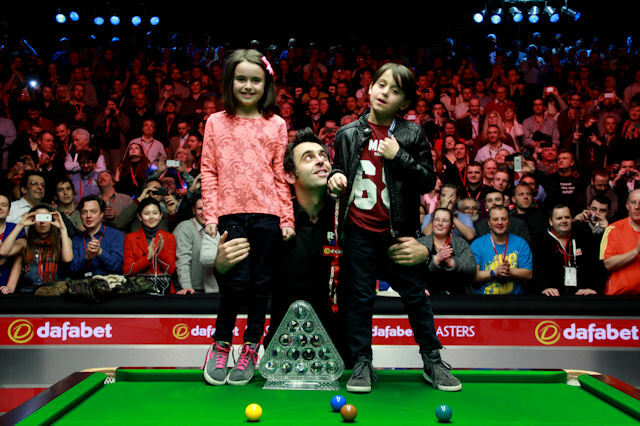 Encouraged by a vast entourage including Rolling Stone Ronnie Wood, artist Damien Hirst, actor Marc Warren, and girlfriend Laila Rouass, as well as his kids Lily (7) and Ronnie Jnr (6), O’Sullivan started the evening session 7-1 up following breaks of 97, 70, 96 and 53 during the afternoon. He quickly extended his lead tonight with a run of 90. A 9-1 lead looked certain until, in a bizarre end to the tenth frame, O’Sullivan missed a sitter of a brown off the last red. Selby cleared to the black then rattled it in the jaws, only for O’Sullivan’s attempt to finish hanging over a top corner. Selby tapped in the black for 8-2, then made an impressive 67 to win the next after his opponent had failed on a red at 27-0. Selby had a clear chance in the next as he threatened a trademark fight-back, but missed the pink off its spot on 23. O’Sullivan edged ahead and potted the last red to make it 9-3 at the interval. When they returned, a run of 67 from Selby saw him pull one back, but a clinical 72 from O’Sullivan in the next sealed the title. “It’s a great feeling,” said O’Sullivan. “I expected it to be 10-9 or 10-8 because Mark is such a competitor and there’s not much between us. He plays better when he’s behind and you’re never over the line against him until you pot the last ball. “I missed an awful brown to go 9-1 and then I was concerned he would get it back to 8-4, so I was pleased to win the frame to go 9-3 at the interval. I told myself to just keep competing. The match against Ricky Walden was a one-off, I was never going to be able to do that against Mark. “I’ve got five World, five Masters and four UKs now and I never dreamed I would do this well. It’s just nice to be playing and competing at 38 because most of the others now are in their late 20s or early 30s. I have set myself a target of winning the world title when I’m in my 40s. Tom Watson nearly won the Open at 59. Selby said: “There’s no one who wins frames in one visit like Ronnie, and makes it look so easy. I should have won the fourth frame and it might have been different if it had gone 3-1. Even at 7-1 I never felt I was out of it and believed I could win. I tried to put pressure on him and build my own confidence.